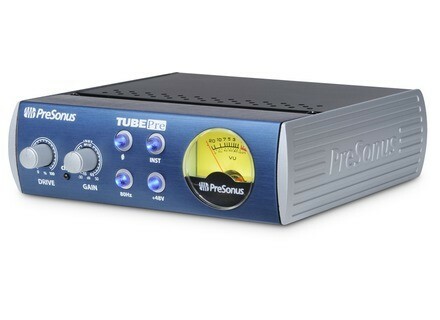 TubePre V2, Tube Pre-amp from PreSonus. PreSonus is now shipping new versions of two of its classic tube preamplifiers: the BlueTube DP V2 and TubePre V2. The BlueTube DP V2 is a dual-path mic/instrument preamp. The solid-state path feeds PreSonus' Class A XMAX mic preamplifier with 80 dB of variable gain. The tube path features a 12AX7 tube. The Tube Drive is designed to let you achieve "anything from gentle warmth to edgy distortion." You also get 48V phantom power, an 80 Hz high-pass filter, -20 dB pad, and polarity reverse. With two combo mic/instrument inputs, the half-rackspace BlueTube DP V2 is suited for guitars as well as vocals. Singer-songwriters can run their vocal through one channel and their guitar through the other, feeding both to the P.A. with no guitar amp needed. It also serves as a DI box, with balanced XLR and unbalanced ¼" outputs, and is housed in a new 1/2U case. Try the BlueTube DP V2 as a front end for a DAW, too. The BlueTube DP V2 is available immediately; MAP/street price is expected to be $229.95. The single-channel TubePre V2 provides various sound options, and a more focused tube saturation than the original TubePre, according to PreSonus. It now employs PreSonus' XMAX Class A solid-state preamp, which is followed in the signal path by a 12AX7 vacuum-tube stage with Tube Drive tube-saturation control. Housed in a 1/3-rackspace case, the TubePre V2 rear panel sports separate unbalanced, ¼" instrument and balanced, XLR mic inputs and unbalanced ¼" and balanced XLR line outputs. The front panel offers controls for gain, 48V phantom power, 80 Hz high-pass filter, and polarity-reverse, as well as a mic/instrument input switch. A lighted VU meter and a clip LED is designed to help you keep an eye on your levels. The TubePre V2 is available immediately; MAP/street price is expected to be $129.95. Visit www.presonus.com for more details. [NAMM] Behringer Xenyx Q Series USB Behringer introduces at NAMM 2012 a new series of 13 USB Xenyx USB mixers. [NAMM] Buchla Skylab & 267e Buchla introduces the Buchla Skylab, a new portable analog setup made up of 13 modules. [NAMM] Telefunken M81 & ELA M 260 Stereo Set Telefunken Elektroakustik introduces at the NAMM Show 2012 two new mics, the dynamic M81 and the ELA M 260 stereo set.